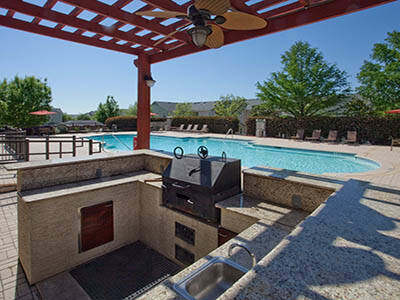 Your comfort and satisfaction are our top priorities at Springs at Live Oak Apartments. That’s why our studio, 1, 2 & 3 bedroom townhome-style apartments feature sophisticated amenities designed to complement your modern lifestyle. Imagine your new life in Live Oak. You start your workday in your spacious master bedroom. You throw on your jeans and walk your pup around the neighborhood, being sure to let her off her leash to run free at our on-site pet playground. When you return home, you make yourself a hearty breakfast and a cup of roasted coffee in your gourmet kitchen, which has beautiful hardwood-style floors and energy-efficient appliances. After choosing your clothes for the day from your spacious walk-in closet, you pour the rest of your coffee in a travel mug. In minutes you can hop on Loop 1604 or I-35 for a quick commute to work. Come tour our studio, 1, 2 & 3 Live Oak apartments for rent to see our sophisticated amenities for yourself. Contact Springs at Live Oak Apartments to schedule your tour today.